After the intense and frantic build-up to the launch of Wanderer – Origins, I’ve spent the past week sitting back and watching how it went down. To be honest, it’s been amazing! There’s a lot in there this week, including updates on Wanderer – Origins’ first week, two competitions, progress on Wanderer – Book Five and a change in pricing policy. I’ve put that change at the bottom as it’s quite a long one, but it is important – and includes an apology. In its first week Wanderer – Origins sold 1,080 copies. That’s a stunning number, made even better by the seven reviews it has received on Amazon.com – all of them five star! Best of all, I’ve had some great feedback from people who loved the book via my blog, facebook, google+ and direct emails. When people take the time to get in touch in that way it really makes my day. Thank you all. A very quick update, with a more detailed one to follow in a few days. Wanderer Book Five has now passed 30,000 words which is a big milestone. With it being the last book in the series I have no idea how long it will be, but Origins was about 140,000 and I don’t see this one being much shorter – so there’s a long way to go, but it’s progressing really well. The two winners of the flash competition have been drawn and notified. If you didn’t win there’s still a week left to enter the Big Competition for your chance to win one of twelve prizes. The quarterly subscriber draw winner has been chosen and notified, and will be receiving a free copy of Last Sunrise & Other Stories. If you’re already a subscriber you will be automatically in the draw each quarter to win a signed eBook of your choice. If not, why not subscribe now? As well as the competition, you’ll also get access to three exclusive & free short stories. I reduced the price on Wanderer books 2 & 3 in the runup to Wanderer – Origins being released, and had the new book at a discount too while on pre-order ($2.99 instead of $3.99). The plan was to increase the prices back to normal once Wanderer – Origins was released. And that’s what I did. I changed the pricing at Amazon and Smashwords (which feeds to iTunes, Kobo, Nook etc) and all the prices went back to their pre-offer levels. Except… not quite. 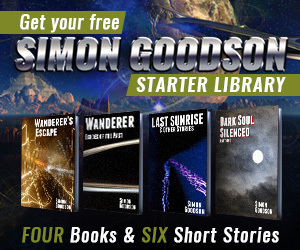 On Friday Sue pointed out that Wanderer – Origins was selling for less than Wanderer – Tainted Universe (book 3) which looked odd. I checked and on Amazon.com and Amazon.co.uk that was definitely the case – it was selling for $2.99. I went to my author dashboard for Amazon and confirmed that I had definitely set the price to $3.99. For some reason Amazon was selling it for less. I’m about 95% certain the price changed at both the US and UK Amazon sites when I increased it, so it looks like Amazon chose to discount for some reason. That could be down to price-matching if Nook or iTunes were slow to update, but normally they’d tell me that was the case. Amazon also have the right to reduce the price anytime they want, though in that case they still pay out the original amount to the author. If they are price matching they reduce that payout. I dropped an email to KDP support and they kindly corrected the price. All finished. Except… (again! )… I’d noticed that my sales had been surprisingly high during the week, for all the Wanderer books. That got me wondering whether it was because some of them were cheaper, and from there I worked out how many more books I had to sell at $2.99 to make the same money as I would at $3.99. The result is obvious once a bit of maths is applied, and 25 years ago I’d have spotted it straight off, but these days I have to work through it. I only needed to sell one third more books. Not only that, but selling that extra third would push my books higher up Amazon’s rankings and in turn lead to more chances of sales. That made it a no-brainer. I’ve now reduced the prices of Wanderer books 3 and 4 to $2.99 (£1.99 etc in other regions) and that will be the most I’ll be charging for books going forwards. So why have I gone into this in such detail? Because I need to apologise. I mentioned on a number of occasions that Wanderer – Origins was available at a discount during pre-order ($2.99) and that it would go up in price once it was released. My intention was to do that, and I did actually raise the price at all vendors though Amazon seem to have countered that, but I’d hate for anyone to think I was being dishonest – especially as it’s possible the book never made it to $3.99 via Amazon or switched back to $2.99 very quickly. I could have kept quiet and hoped no one noticed, but one of the most important things about being an indie author is being able to make such strong connections with people who like my books. In my eyes that brings a responsibility with it, so I wanted to both be honest about the price changes and explain what prompted it. I hope no one feels they were conned, and if they do I’m really sorry.